If you would like more video storage capacity, you can upgrade to a larger hard drive. You can change amount of wiring as well. Please select below. You can add a monitor to your CCTV System. This HD CVI Dome Camera System includes Eight 1 Megapixel Dome Cameras that provide true 720p video resolution. These cameras paired with the included 8 Channel HDCVI DVR record 720p high definition video equivalent to that of a DVD. Equipped with 24 infrared LEDs, these HD dome cameras have 66ft of night vision in darkness. The 3.6mm fixed lens on the camera provides an 80&deg; view, making them perfect for placement indoors, at entry points, and outdoors for general surveillance of your property. These dome cameras have a very rugged construction; they are made of metal and are vandal proof and are also weather proof rated at IP67. That means they are very water tight and can be placed outside in tough rain, or snow and they will still keep functioning. You can mount the camera on a wall, ceiling, or on a pole without the need for any shelter above. The vandal proof feature of the camera prevents the camera from being manipulated by passersby because it locks in to place after being properly installed. Its metal camera casing allows it to even withstand slight blows. To properly install this camera, we suggest that you place it directly over the drilled hole for wire so that cabling passes through the bracket and in to the cavity for the wire you made in your wall or ceiling; this prevents cable snipping. The cameras also have a 3-axis eyeball design that allows the camera to be angled in any direction, even upside down. The 8 Channel HDCVI DVR 720P included with this HDCVI system has too many features to list on one page, so we have summarized all the popular ones. The DVR recorder is a high definition one of course to record the 720P video coming from the cameras. It has multiple recording settings, including motion detection, continuous 24/7 recording, and calendar day & time based recording. You can even combine multiple recording and set each method for the cameras individually. It also features auto video recycling, so when the DVR's hard drive is full, it will overwrite the oldest video first. You can even set that setting off and do it manually. The DVR uses a high speed processor and embedded Linux operating system so it will stay virus free unlike computer based systems. It has a very easy to use user interface that you can control with the click of a mouse. Viewing your cameras and reviewing recorded video is very easy and fast. In the video search menu you get a calendar to choose the day from which you would like to playback your CCTV footage, and choose which cameras you would like. The DVR displays video in full screen or in a grid, and there is a very helpful time line that let your skim through video recorded for that day. You can even fast forward and speed through video or slow it down and look at an event in detail. If you have motion detection activated for that channel, you can quickly look at just the motion events, saving yourself hours of looking at recorded surveillance footage. You can review the complete description for the HDCVI DVR included in this system by clicking on its link in the What's Included section. If you don't see something you are looking for, feel free to ask using the Ask a Question section above. 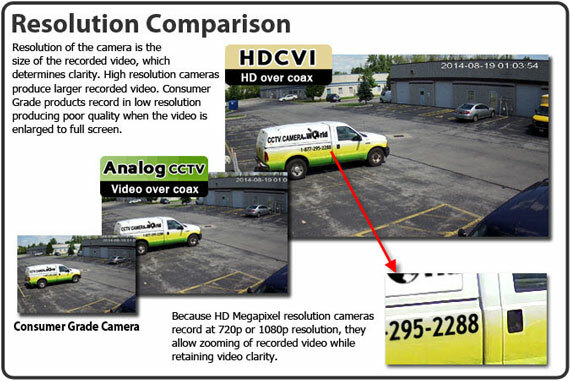 At CCTVCameraWorld we feel that whether you are looking to upgrade your CCTV cameras to HD video, or you are building a new system altogether, HDCVI camera systems must be taken in to consideration. 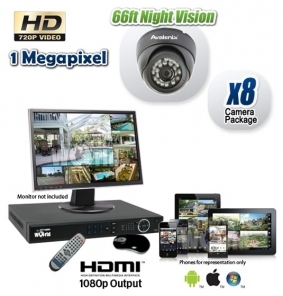 HDCVI systems such as this one are the answer for customers looking for affordable HD CCTV cameras. Not only is the cost per camera low, but you can use existing RG59 coax cabling to run the video signal. This system comes with Siamese cabling which is video and power run in one line. This eliminates the need to have power access in the immediate vicinity of the cameras. Simply run the cabling from the camera to the DVR and attach to a power supply located near the DVR. This system is easy to install. Simply mount your cameras in the desired location, run the Siamese cabling that is included with the system back to the DVR. Connect the coax to the DVR and the other wires to your power supply. It's that easy! Once you install your system, give us a call and we will assist you in setting up your remote viewing options. You can also check out our YouTube channel that is loaded with great tutorials and product videos that we made just for you! Our systems can be customized for each individual user. You can choose the length of cabling, storage space, ability to add on cameras, and add on audio recording. When you purchase one of our systems, there are no contracts to sign, no monthly fees, and no hidden charges. The price you see is the price you pay. Our products all come with a manufacturer's warranty. If any manufacturer defect occurs, we will always honor the warranty. We offer a 30 day satisfaction guarantee. If you are not completely satisfied with our product within 30 days of purchase, we will accept exchanges or provide credit for the purchase price. All of our products come with US based technical support, free of charge, for the life of the product.